In November 2017, the European Commission proposed new CO2 emission standards for cars and light commercials sold in the EU until 2030. A 15% emissions reduction over agreed 2021 standards by 2025 was suggested, with a 30% reduction by 2030 – combined with manufacturer incentives to encourage battery electric (BEV) and fuel cell electric vehicle (FCEV) production. Critics feel the proposals aren’t enough and with Europe’s political situation slowly changing, suggested tougher targets of a 25% reduction by 2025 and 50% reduction by 2030 could yet become reality. 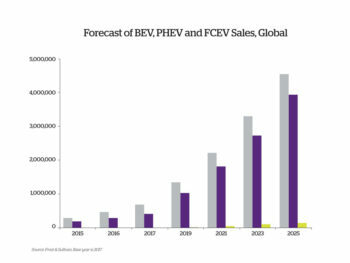 Higher targets will increase manufacturer pressure to reduce average vehicle emissions through increased sales of battery electric and fuel cell-powered vehicles. 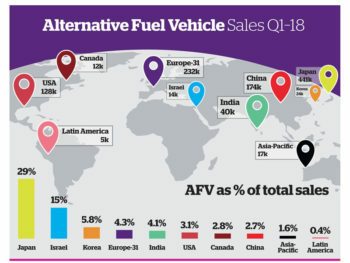 BEV sales recently passed one million units worldwide, and figures from automotive data research specialists JATO, indicate 1.08m alternative fuel vehicle sales in the first quarter of 2018. Yet only 653 of them were fuel cell powered – 4% less than in 2017 – bringing 19 years’ worth of FCEV sales worldwide to just 6,062 cars. Things are moving – but slowly. 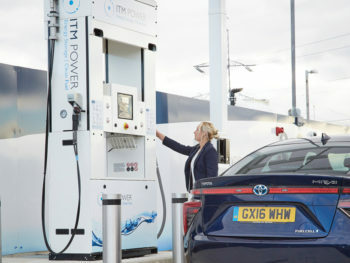 At the end of 2017, the Hydrogen Council estimated over 5,000 hydrogen refuelling locations were planned, while Frost & Sullivan’s analysts believe that over 7,500 could be operational by 2030. Yet just 64 new stations opened worldwide in 2017, including 24 in Germany, making its network the second largest worldwide. Japan has most, with 91 public stations, while the USA has 40. A recent study of fleet operators on future take-up of hydrogen mobility by the UK-based H2 mobility partnership found clear preferences for low-emission, long-range, fast-refuelling vehicles. Operators were unwilling to pay large premiums for FCEVs, and proved very sensitive to taxes and charges imposed on company vehicles. Special tax structures or exemptions making FCEVs closely competitive with diesel vehicles were popular, with efficiency and zero-emission levels to match BEVs also important because of company commitments to responsible environmental behaviour, and recognition of a growing need to ‘future-proof’ fleets wherever possible. Governments have long used incentives to encourage low-emission vehicle purchase – and research in Europe’s seven biggest markets last year confirmed that targeted taxes and incentives encourage take-up of lower-emitting vehicles. The study found widely varying national policies, with 23 European countries offering tax and circulation incentives for electric vehicles including FCEV, and 18 offering benefits ranging from free parking to reductions or exemptions from toll charges or charging zone fees. The study also found company-specific car tax benefits for zero- and low-emission vehicles were growing rapidly, offered by 12 countries in 2017. Just three FCEV models are currently available worldwide: the Toyota Mirai, Hyundai Nexo – replacing the iX35 (Tucson in the US) and Honda Clarity. Manufacturers won’t discuss future plans, but industry-watchers believe at least 20 models – from up to 10 different manufacturers – could join the FCEV marketplace in the next five years. Rumoured names include Mercedes-Benz, Lexus, BMW and Kia – with other major names soon following. Fuel cells first established themselves in space travel and submarines because they allow big stores of energy to be carried as liquid hydrogen and oxygen. These weigh much less than batteries, and can generate enough power for lengthy missions. Fuel cell vehicle powertrain development began in the 1980s at Daimler. Mercedes-Benz unveiled the Necar 1, the first fuel cell vehicle with a ‘polymer electrolyte membrane’ in 1994. An A-Class F-CELL test fleet followed in 2003, by which time vehicle makers around the world were working on their own fuel cell-powered prototypes. A worldwide hydrogen vehicle refuelling standard has existed since 2002. An update in 2008 doubled the original 350 bar tank working pressure, allowing vehicle range to increase by over 70%. The breakthrough was achieved through multi-sector cooperation, led by the Clean Energy Partnership. The energy density of hydrogen is around 13 times higher than that of today’s lithium-ion vehicle batteries, which deliver around 125Wh/kg while the figure for hydrogen is about 900Wh/kg. This means hydrogen-powered vehicles can carry more energy, giving very long range, which along with faster refuelling is one of their big advantages. Today’s fuel cell vehicles already achieve double the overall efficiency of internal combustion engines, and depending on operating conditions they can be up to 65% more efficient. However, a fuel cell converts hydrogen and oxygen into electricity, and as a converter it can never be quite as efficient as a battery. However, this isn’t a big weakness, for the waste heat it generates can be used for vehicle heating.